Liverpool loves its hidden locations. Record shops in basements, concert venues above cafes and underground bars in even the most packed of streets are commonplace. The Well Space on Roscoe Street is no different – walk down the narrow road and enter through the gates near the Mount Pleasant side and you’ll discover a small warehouse kitted out with a bar and seating area. The Well Space prides itself on being an “independent creative & social space”. By day, it’s a place for people to chill, but after 5pm it’s a spot for musicians, artists and performers to promote their craft. 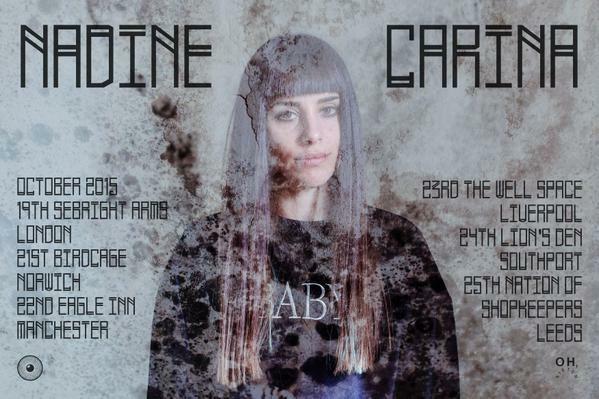 It’s here that Swiss artist Nadine Carina, who has studied and lived in Liverpool, chose to perform her brand of electronic music. What was instantly striking about the venue was its size. Those used to expansive spaces and large stages would be surprised to see the performers stood in the corner of a small room, surrounded by their audience. It was a beneficial setup which allowed a sense of community, as if the concertgoers were all close friends. With venue staff, concert promoters and fans alike mingling throughout so casually you’d be forgiven for believing this. Preceding Nadine were two warm up acts, the first being solo singer/songwriter Astles. His primarily stripped-back sound worked in the smaller environment, echoing throughout the warehouse and highlighting the strength of his voice. Even with an excellent cover of Bruce Springsteen’s ‘Dancing In The Dark’, the concern was that Astles’ music could feel too similar throughout his set, but luckily he mixed things up a bit. The use of synths in highlight track ‘Her’ was the best example of this, providing a bit of variation for a chilled-out, minimalistic performance. Next up were electropop duo Seattle Yacht Club, who compared to the mellow tunes of Astles were much more focused on upbeat rhythms. Opening track ‘I Hate Goodbyes’ was immediately fun and addictive, a standard the rest of their set would match. Their strong production values and vocal quality ensured that every song remained fresh, and while they’re reminiscent of current bands like Chvrches and Prides, their heavier use of rock and pop provides a different appeal. It was finally time for Nadine Carina to take centre stage. She had been watching the acts perform from the audience area, a testament to both the event and the venue that her appearance amongst the spectators felt so natural. Onstage though, she manifested into a performer with a magnetic stage presence, both captivating and commanding. Throughout the night, Nadine introduced the crowd to a mix of her discography, including tracks from new album ‘Never Been To Heaven’. It’s electronic music which feels almost ethereal yet powerful, and it’s presented well in a live setting. Her vocals weaved in and out of the production of songs such as ‘By The Lake’, almost as if her voice was a part of the electronic music itself, instead of merely accompanying it. Nadine’s set felt eccentric from the get-go. The use of wildlife and nature sounds was certainly strange, and anyone unfamiliar with her music would find it bizarre. She made it work, however, and combined with her strong electronic synths it felt like an effortless synergy. Even in a world of musicians heavily influenced by Björk and Kate Bush, Nadine’s music is wonderfully weird. Despite this, she also swayed towards more conventional tracks at times, such as ‘It’s You’ from her side project Mangocats and a few songs which utilised an alt-R&B/electronic sound commonplace in today’s music scene. Despite all this, there was never the sense that Nadine’s music was difficult to listen to. On the contrary, a live setting did wonders for the material. The concert felt almost like a contradiction – the music was big yet small, magical yet grounded, comforting yet strange. Everything seemed to click into place, from the heartening venue to the strong impact on the audience. Simply put, the night was enchanting.